Such a title sounds like an admonition, a cold observation, a sad reckoning. It sounds like the kind of thing someone would say to an absent parent, especially, but I can imagine a bunch of other situations where someone could say it and mean it, too. 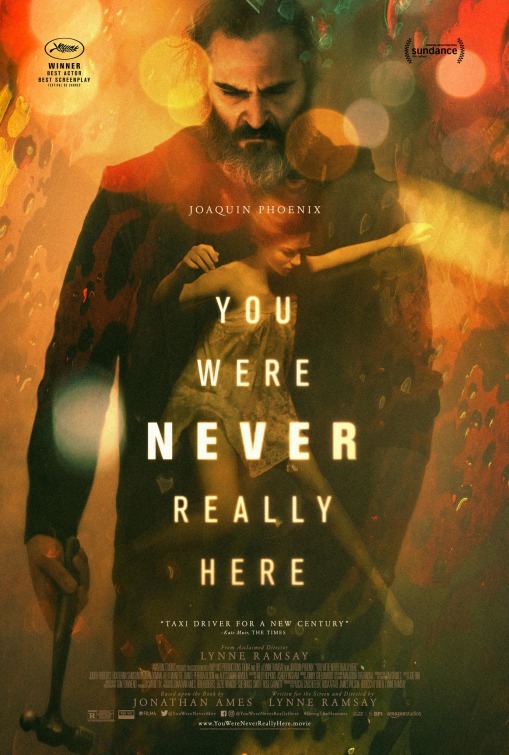 You could say to someone “you were never really here”, and it would be an acknowledgement that even if that person was actually, physically there the whole time, their mind, their emotional investment, was somewhere else, focused on something or someone else. If nothing else it emphasises absence over presence, and we can safely assume it’s not seen as a positive quality. I cannot say that I entirely know what it means in the mind of the author of the novella that this is based (by Jonathan Ames), or in Lynne Ramsay’s mind, but the main character definitely has a lot on his mind, and if he’s a bit distracted, I can understand why. Joe, as played by someone who clearly already has mental health issues, being Joaquin Phoenix, has a mass of mental health issues and an array of traumas from which crests a continued existence of remarkable precariousness. That’s a fancy way of saying Joe is so messed up I’m amazed he can get out of bed. Almost every action flick with a jerk at the centre of it has a tragic backstory where someone’s wife died or someone’s kid died, and they have to make up for it by killing a bunch of people in order to save some other woman or child. And then, when that’s done, they can be rewarded either by partnering with the woman, adopting the child, or dying, or all three. It’s the standard screenwriting playbook, as lazy and as repeated as a Valentine’s Day card’s banal message. Is it really that different in the hands of Joaquin Phoenix and Lynne Ramsay? Well, do you remember what else Lynne Ramsay’s done? Do you remember watching We Need to Talk About Kevin? If you did watch it, do you remember watching it a second time? Could you ever bring yourself to watch it again? I think not, but that doesn’t speak as to the quality of the films she makes. They are high quality and like no-one else’s films. Her approach is distinctive and amazing in equal measure (not really, but it seemed like the right thing to say at the time). They are definitely memorable, but the reason you remember them is not because of the dialogue, or the script in general. It’s because of the way she chooses to tell her stories visually, and how unsettling an experience it is to watch them. She finds the most distinctive but sometimes most obtuse ways to get her images and ideas across. And she wants you to remember her images, the same way in which the protagonist here can’t stop thinking about the horror-show going on in his own head. Joe’s traumas begin early, in childhood, at the hands of an abusive parent, but he has also clearly seen terrible, truly terrible things in a time of war, and as an FBI agent, images that haunt him constantly, and now some of them will probably haunt us too. Now those times of course are behind him, but his current circumstances guarantee that he’s not ever very far off from doing something terrible to someone, but for money. Cold hard cash. Joe rescues kidnapped children, or children sold into sexual slavery, or children that have fallen through the cracks, but it’s for money, not because children are precious or wonderful. And he’s not only hired to rescue the kids, but because he is brutal. The tool of his trade is the ball peen hammer, which is a tool, obviously, but not the one usually which steaming bowls of rich, creamy justice are meted out with. There’s no explanation given as to why always with the hammers, but I guess it’s practical (it’s possibly also a childhood traumatic fixation that he carries with him forever and ever amen), and it saves one’s knuckles from constantly getting chewed up by other people’s faces. Does one repair or reinforce trauma from childhood by reliving it? I guess one has to do it a couple more hundred times to find out for absolute sure. We first see Joe at the end of a job. We are not told the details of the job, we just observe his rituals dealing with the aftermath of whatever it is he did. There are some girl’s keepsakes, a SIM card to be destroyed, a bloody hammer to be wiped off, other elements that need to be expunged. And then a plane ride from Cincinnati back to New York, I assume, though it’s never stated. We’re not meant to sympathise / empathise with Joe, I don’t think. Making him an empathetic or relatable character would go against what Lynne Ramsay wanted. And more power to her, because she doesn’t trade in easy scenarios or likable characters, seemingly, ever. Revenge tales where someone kills all the Mafia or Triad goons or Russian bratva or avenges the death of a child or the abuse of children is easy as anything to make relatable. That is the morally bankrupt legacy of so many action movies and dramas that make the “hero’s” journey such a cop out, a lot of the time. Sure, our culture is saturated with the idea of people taking the law into their own hands because the System, man, it just doesn’t look after the little guy. It only looks after the rich and powerful, and therefore if you’re given a good enough reason, like, if the people who wronged you really, really deserve it, because they hurt kids, or killed someone you care about, isn’t that a tad too easy? What I remember whenever I watch yet another action film with this kind of premise, is Snowtown, both the movie made about what happened, and what actually happened. In both real life, and in the movie, John Bunting believes himself to be a righteous man, one who is doing, ultimately, the right thing. And many a person, one who perhaps lacks a certain integrity could think, “well, a serial killer who kills people who society hates is maybe even a hero, because they’re doing society a service”. To say something like that a person has to ignore the obvious reality that, especially in Bunting’s case, he just wanted to kill people. The criminal histories of the initial victims faded away to nothing when it became obvious that he just loved killing. And that’s what a lot of the vigilante – ordinary citizen killing a bunch of people, hopefully of a different skin colour to himself or herself – genre essentially does. They wrong the protagonist in unspeakable ways then serve up a film’s worth of justifications as to why the protagonist should flat out murder all the despicable people that they want, because it’s entirely justified in their eyes and our eyes. But Joe, Joe, we don’t really know what’s going on in his head. I mean, we see the flashes of the awful stuff he’s seen over time, and we see him maim and kill a whole bunch of people, but we don’t know if he enjoys it or hates it, and he doesn’t seem functional enough to have a rationale or justification for doing it, from his perspective. Also, Ramsay doesn’t go to any lengths of making Joe’s righteous or otherwise vengeance look cool. Something like the John Wick flicks this ain’t. There is no cool stylised violence or choreography in this. The violence is brief, muddled, grubby, desperate and ugly. Joe may be a sadist, but we aren’t going to know, because he is inscrutable. There aren’t explanations or pat monologues to sympathetic characters that illuminate for us where Joe actually exists, in his own head or in the world, enough for us to really know whether he is actually really there or not. Joe is given another job by his handler / employer / only friend in the world (some random mafia looking guy) to save the child of a senator, who has somehow been sold into sexual slavery. That was a sentence as painful to read as it was to write. Joe’s on the case, and we see him stock up on supplies from the local hardware store, and the reconnaissance begins. Joe is so familiar with such a world that it is almost more horrific than the premise itself, that someone could have seen it so many times in the course of their work that they know what to expect. He finds the place, scopes out the situation, figures out a plan of attack and achieves it, theoretically saving the poor girl, but things take a turn for the surreal, or at least the more surreal, when it turns out that the people who perpetrated this horrific state of affairs are even more powerful than the senator whose daughter he’s trying to rescue. Even more bizarre than that is the fact that this doesn’t then end up becoming a whodunnit or whydunnit, as precious little time is expended with explanations of plot or motivation or anything. Mostly, the reptile-brained Joe, reduced even further by having the little he has ripped from him the same way he rips out one of his own broken teeth with a pair of pliers: Messily, bloodily. He will chug towards an ending where people want to kill him only slightly less than he wants to kill himself. The killers target his mother, and of course Joe’s not going to let that stand, but once he downs the perpetrators, he spends an almost affectionate couple of minutes chatting with and singing to a golden oldie song on the radio with the guy he just butchered, who in turn tried to kill his mother, and who explains a part of the plot that would otherwise have completely eluded us. Beyond the plot the greatest danger we keep being confronted with is that Joe really, really doesn’t want to be around, as in, he doesn’t really want to be on this planet any more. He’s suicidal even before the film’s begun, and throughout the flick we keep seeing him fighting the impulse to kill himself. A lot of the time the thought of helping someone, of saving Nina (Ekaterina Samsonov), is literally the only thing that pulls him out of his trajectory. The thing is, though, this is not a story about redemption through saving a child. Joe can’t really save himself or Nina (not to spoil anything, I mean in the broader sense). He is too far gone, she has seen too much of this world, of the ugliest that life can provide, so Joe is never going to regain or retain his humanity, no matter how many people he beats up or kills with a hammer. That doesn’t work, that couldn’t work in any world that we can imagine, and Lynne Ramsay and Joaquin Phoenix clearly can’t imagine a different world either. You can’t even really talk about the performances without noting that while Phoenix has almost always been an utterly compelling presence on screen, he seems to look and act like a person you would absolutely not want to work with. He would be utter hell to work with, but the performances are like little else you ever get to see. He can give tender and charming performances (I’m thinking predominately of the sublime Spike Jonz film Her, which was two hours of watching him talking to someone on the phone, and I loved every second of it), but he can also give performances that are completely devoid of those qualities. Here he is like a flat-eyed revenant, an undead thing that’s clawed its way out of the grave with nothing other than hammers on its mind. Ramsay has constructed what I am guessing is exactly the flick she wanted to make, and that’s kind of terrifying. She has no interest in making conventional movies, and that’s fine too, because everyone else does. She has no interest in making anything that’s comfortable or easily digestible, and she utterly achieved her aims. That being said, as uncomfortable and unsettling an experience as this might have been, and should have been, and as well constructed as everything was, as spare as it was as well, I have seen this kind of story too many times before, so much so that even a strong variation on the theme doesn’t resonate with me that much. I appreciate the lengths that they went to show how awful existence would be for such a traumatised individual, but I kind of already knew. Maybe I will watch this again, to see what I maybe missed, one day, but it’s unlikely. Lynne Ramsay’s films are complex and exquisite surgeries one doesn’t really want to relive unless one absolutely has to.